Although Columbia, the second pioneer company in the field of disc records, started production of them in late 1901, the firm did not set up a Canadian operation until 1904, by which time they were already established in New York, London and other major European cities. Roll Back the Years gives Columbia's initial address as 107 Yonge Street in Toronto. Further, as near as can be established, the Canadian operation served only as a distributor of American (and, later, English) records, although it was not too long until the records were pressed in Toronto from imported stampers, in all probability due to tariff considerations. To my knowledge, there is no evidence that any records were cut in Canada, as will be discussed throughout this series of articles, although I suspect the possibility that some of the French-Canadian material issued on the green-label (E-) "International" series may possibly have been recorded in Montreal. In any case, Columbia's "Canadian connection" was kept relatively unknown. Many of the records apparently used U.S. labels (or were themselves imported) as the records are marked with both U.S. and Canadian prices, while those pressed in Canada are only identified by a slight alteration in the license statement, which reads "... this record may not be sold in Canada ...". The similarity of the label and the typography suggest the labels may well have been imported also! English Columbia records, known at this point as "Columbia-Rena" were pressed in Toronto also, using imported labels; one unusual pressing, in fact, couples a U.S. military band number with a U.K. version of "It's A Long Way To Tipperary", with each side bearing the label and number of its original issue! Other than this oddity, the first items appearing in the Canadian Columbia catalogue not in either of the parent catalogues were a direct result of Canada entering World War I long before the U.S. This was the "Patriotic" series, bearing an ornamental red/white/blue label and numbers in a "P" series. The material, of course, was all war songs, varying from marches to more plebeian fare, and all that I have seen were recorded either in London or New York. The English sides may well have appeared also on U.K. Columbia, while the American sides seldom if ever appeared in their home country. Some thirty odd records appeared in this series, which inspired Berliner to deck some of his patriotic material in a similar label. In mid 1916, probably shortly after Berliner introduced his Canadian-content (nominally!) 216000 series, Columbia introduced an R-4000 series. Unlike Berliner records, the Columbias used American and English masters, although many if not all were made especially for Canadian issue. The scope of material was not as wide as Berliner's, either; it consisted of much English material, mostly standard, the usual national songs, and a very few popular numbers. Furthermore, while Berliner issued close to 500 records between 1916 and 1924, Columbia issued less than 60 in virtually the same period, and judging from their relative availability today, the Berliner HMV's far outsold the Columbia counterparts. In the meantime, the Patriotic series was apparently dropped in 1917 or 1918, with the last issues bearing a simpler blue-on-white version of the label. It was apparently around this same time that Columbia in Canada quit pressing the English Rena records as such and substituted an R-series using the North American label. The records were issued under their U.K. number with an R- prefix (indicating Rena?). It is not clear at this point if these were issued similarly in the U.S. As with R-4000 series, the majority of the issued material is of minimal interest to all but the most dedicated musical masochist, with the exception of sides by Joe Hayman (of "Cohen" fame) and Billy Williams. Shortly thereafter, in late 1916, Canadian Columbias became slightly more recognizable. The labels still bore no mention that a Canadian operation existed, other than the slight rewording of price and license information, but the typography of the credits began differing noticeably from the U.S. issues, apparently indicating that Canadian-manufactured labels were in use. This produced at least one interesting situation: the Canadian issue of the Dance version of "Whispering" was issued with titles (not labels) reversed, which must have confused the north-of-the-border buyer somewhat! One interesting sidelight of Columbia's Canadian operation, at least to some collectors, is the existence of two specifically Canadian demonstration records (one and one half, in reality). When the second of the two records extolling Columbia Double-Discs appeared, it appeared in both an American and Canadian version, with the Canadian records selling for 30 cents rather than 25 cents. Further, when the Patriotic series was introduced about 18 months later, Columbia took advantage of the interest in it to recouple the promotional announcement with one of these sides. One further visible, bit not audible, variation exists: apparently at some point the Canadian operation either ran out of their demonstration records or were delayed in issuing them, and copies of the U.S. issue have been noted with the price overstamped with "30 cents". The entire Columbia operation in North America was, however, falling on hard times by the early 1920s, as economic slowdown and the coming of radio combined to seriously affect the record market. Columbia issues grew less in number and major artists moved to other labels. Finally, in late 1923, a rescue operation was called for. In the fall of 1923, the Columbia Graphophone Company went into receivership, having previously sold its English subsidiary. The English operation, in turn, helped to provide the financing to reorganize the successor Columbia Phonograph Company. In 1924, the Canadian operation was sold to Canadian owners, although there was no change in the basic operation of the relationship to American and English firms. The English operation had, in fact, salvaged their American counterpart primarily to retain rights which were being negotiated with the Western Electric Company to a new electrical recording process. The changeover in North America was marked by two things: the introduction of a unique label, primarily in various metallic colours (bronze for popular records) and decorated by tricolour banners (and hence known as the "flag" label); and the change of record numbers from an A- prefix to a D- suffix. The R-4000 series was replaced by a 16000-D series, still primarily (if not entirely) from English sources and still using a minimum of popular material. Released only in Canada, the 16000-D series, appears to have included some Canadian material, at least toward the end of its life in 1932. They appear to be primarily, if not entirely, recordings made at a yet undetermined site for issue originally on the 34000-F French series, comprising various country dance records; artists include Ben Hokea, and several French-Canadian performers of traditional Québécois material. The highest number seen so far in this series is 16129-D released early in 1933. In May 1925, the first electrical recordings were introduced, and shortly thereafter the "flag" label was replaced by a gold-on-black label based closely on the English Columbia label introduced earlier. The label did not mention electrical recording, however, until about a year later, in spite of the fact that Victor's Canadian operation (now no longer Berliner) had "jumped the gun" by announcing the "V.E." (Electrical) process as soon as the first records appeared. During the use of the black label, Columbia apparently reverted to the use of U.S. manufactured labels (or exact duplicates) with no mention of Canada at all. This was not true, at least for a short time, of Columbia's "bargain" Harmony label. It has been assumed that the lower-priced Harmony label was created due to Columbia's having completely redesigned their acoustic recording equipment just before the introduction of electrical recording rendered it obsolete. Certainly the Harmony records have a high quality of sound for acoustic recording, and Harmony was the last label to convert to electrical recording, using acoustically-cut masters into early 1930; both of these would tend to verify the possibility. In any case, the first records on the label in the U.S. were priced on the label at "Fifty cents, fifty-five cents west of the Rockies", while the first hundred-odd Canadian issues bore the equivalent legend, "Fifty cents, fifty-five cents west of Great Lakes" and a manufacturer's credit with a Toronto address. The issues thereafter, like their Columbia counterparts, bore identical labels to their American counterparts, as did all Velvet-Tone records, with only the record sleeves admitting to their Canadian origin. Another event involving Canada, although this time less directly, occurred also in 1925. The Compo Company had set up a U.S. subsidiary around 1922 to sell records to the large French-Canadian population in New England, using Montreal-recorded masters issued under the "Apex" name rather than the Starr label on which they appeared in Canada. In 1925, Columbia in the U.S. bought out Compo's New England operations and used Compo masters on their 34000-F French-Canadian series, this being one of the few times that a non-Columbia master was used on Columbia records and lending credence to the assumption that Columbia's Canadian operations did not have recording capability. Sometime later, probably in 1928, the masters changed to an 110000 series; it is not clear if these are Columbia-recorded masters (and if so where the recording was done) or control numbers to disguise the use of Compo material. The 1929 crash, the ensuing depression, and the ever-increasing popularity and availability of radio seriously affected the record market, and Columbia was in an even worse position than Victor, with no radio connection. In 1932, Columbia was acquired by the Grigsby-Grunow Company, who manufactured Majestic radios in the U.S. Shortly thereafter, Columbia introduced "Royal Blue" records as a sales gimmick. Since Columbia's records, unlike most, consisted of two plastic sides laminated to a coarse shellac core, this could be done easily. The public, however, could no more afford expensive blue records than expensive black records, and the parent radio firm was itself in trouble, attempting to survive in a crowded radio industry. Finally, in 1934, the Grigsby- Grunow Company failed, and the Columbia record division was put up for sale. One of the prospective purchasers was Herbert Berliner, but the money was not available, with his Compo Company itself struggling. The Columbia operations were finally purchased by the American Record Corporation, one of the two firms at the time still in the record business to any extent in the U.S., for the amazing sum of $70,000. Since ARC was already issuing the Brunswick label, the Columbia issues virtually disappeared, except for the classical "Masterworks" series and a few artists under long term contract. Columbia's Canadian operations were dropped entirely, as Compo issued ARC material in Canada until 1935-36, and what few Columbia records were sold in Canada were imported U.S. pressings. Finally, in 1938, the American Record Corporation was itself sold. As previously mentioned, the operations of Columbia in Canada came to a complete halt in 1934, after the record division of the bankrupt Grigsby-Grunow firm in the U.S. was acquired by the American Record Corporation, whose material was being issued in Canada by the Compo Company. Compo, in fact, is said to have been interested in themselves acquiring the defunct Columbia operation - an event which would certainly have changed the Canadian recording industry - but did not have the money, even though the entire operation finally sold for $70,000, including not only the catalogue, masters and trade names of Columbia but one of the best available recording and pressing facilities. From the July 1934 takeover onward, U.S. Columbia issues in the popular series dwindled. From this point until mid 1935, about 100 records were issued on Columbia. Sometime in mid 1935, the unique blue laminated pressings were replaced by standard black, and during the following twelve months about 75 items were pressed on Columbia. The last period brought another 25 records, and new issues ceased appearing in the fall of 1937 with 6 sides by Fred Astaire which also appeared (as did other Astaire Columbias) on Brunswicks. The last 9 items were special issues: four sides by Benny Goodman on a special "All-Star" label, one Ted Lewis pairing of reissued material and a commemorative album of twelve Bessie Smith songs which ended the D-suffix series in late 1937. ARC was using Columbia primarily as a classical label, with much English and European material issued on the Masterworks series to compete with Victor's Red Seal records; this meant that classical issues on the Brunswick label were virtually discontinued - a listing for 1935 shows a total of five records, four of which were standard songs by James Melton. None of these Columbias were pressed in Canada, as Columbia or ARC had no Canadian operations. It is reasonable to assume, however, from the fact that the Masterworks records and albums of this era are regularly found in Canada, that the records were imported, although through what arrangement is not currently known. Whether this arrangement included the popular series is also unknown, as the post-1934 Columbia records are scarce even in the U.S. In 1938, the Columbia Broadcasting System acquired the American Record Corporation. For obvious reasons they chose to revive Columbia as the "flagship" label of the operation, and in September 1939 an all-new Columbia record was , including not only the Brunswick artists but several name bands, the most important of which was Benny Goodman. Vocalion was at first carried over as the 35 cent companion label, but it was replaced in 1940 by Okeh, which had been a Columbia subsidiary for a number of years after 1925. The Columbia numbers started at 35200, for some unknown reason, while the Okeh, on a violet label, continued the Vocalion numbers. The Brunswick label was carried on until mid-1940 as a specialty label, then dropped and finally sold, with rights to pre-1932 masters, to Decca in 1943. In early 1940, Columbia made arrangements with the firm Sparton of Canada, in London, Ontario, to press a series of Canadian Columbia records, using the familiar red labels. At first, this consisted primarily of sides released on Vocalion/Okeh in the U.S. - Columbia records were presumably imported - but within a short time the more popular Columbia records also appeared in this series. The records were numbered differently than their U.S. counterparts, with numbers starting at C-1 for the red-label series, and the Sparton firm credited below the trade mark. These sold for 50 cents, as did their American counterparts. A very few records, such as some by Canadian George Formby, had no U.S. equivalent. There were several other series. Records in albums carried a green label, a number in a C-6000 series and a 75 cent price (! ); this series also included a handful of issues, ranging from jazz reissues with no U.S. equivalent to British material. There was a second green label series, with C-8000 numbers, which appears to include material by certain artists, most prominent among which was Dinah Shore. This may also have carried a premium price. 12" red label issues, of which there were very few, were numbered in the C-25000 series. Masterworks records had blue labels, appearing at first in C-10000 (10") and C-15000 (12") series, to which a C-12000 and C-2000 series, both in 12", were added. The reason for the various series is not clear, unless they related to U.S. Masterworks series, as all the 10" Masterworks sold for $1.00 and the 12" for $1.25. Albums also carried different numbers, with popular albums in an A- series and Masterworks as D- and J-. Not all U.S. albums or records had a Canadian counterpart, however. 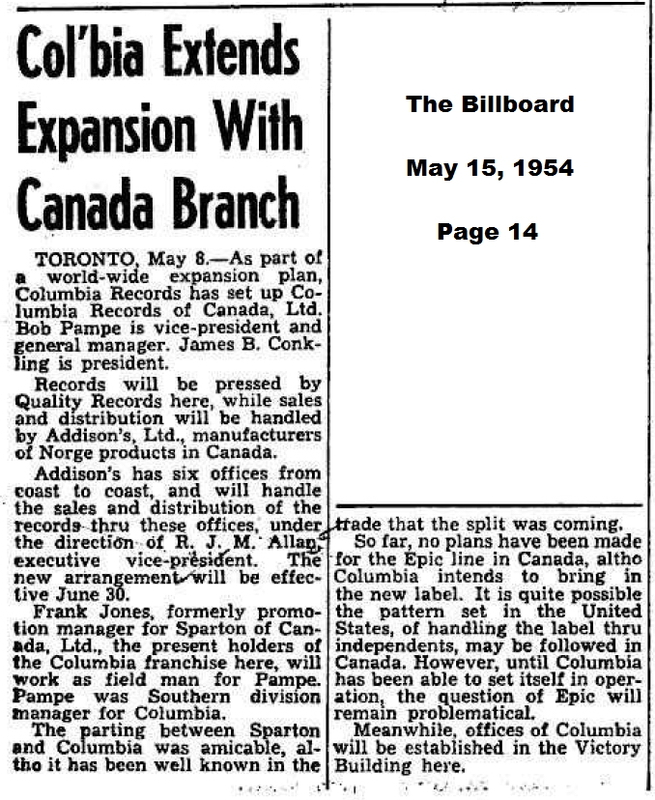 At or near the end of 1954**, Columbia set up a Canadian subsidiary and ended the pressing arrangement with Sparton. By this time, the popular series had reached the 2500's, the album series the 6600's and the main Masterworks series through 15000 and well into 16000. At this time the C- numbers were dropped and Canadian Columbias began appearing under the U.S. numbers. This label, although essentially similar to the familiar red Columbia labels, is slightly different, both in colour and typography, from the Sparton and U.S. labels. One significant difference is the display of the date of issue on the label. Sparton, meanwhile, launched its own label, drawing mainly from independent U.S. labels for masters. In 1958, Columbia introduced a new "modern" label in both U.S. and Canada. The Canadian version is silver on wine-red. The label was in use for a very short time in the U.S., as 78s were dropped there in July 1958; however, Columbia continued issuing 78s until at least August 1959, although it is likely that not all items appeared on 78, with Country records apparently being the last thus issued. This concludes the segment on Columbia.